Yellow gold has long been a trusted metal that has been highly praised for its value and adaptability when it comes to the making of fine jewelry. This stunning Initial Script Monogram Ring demonstrates those qualities and offers a unique and custom ring that makes a great addition to any outfit. The ring is available in a range of styles and can be customized with three initials of your choosing in either 10k or 14k yellow gold. Give a gift they will love and cherish forever or give yourself a gift that you will enjoy wearing day in and day out. Apples of Gold has the selection and is the place to look for customized fine jewelry. 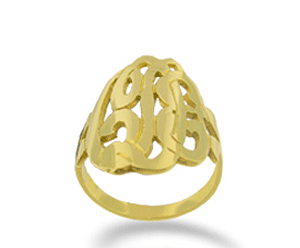 We guarantee our Yellow Gold Initial Script Monogram Ring to be high quality, authentic jewelry, as described above.